Submitted by Quest-News-Serv... on Mon, 01/05/2015 - 14:54. 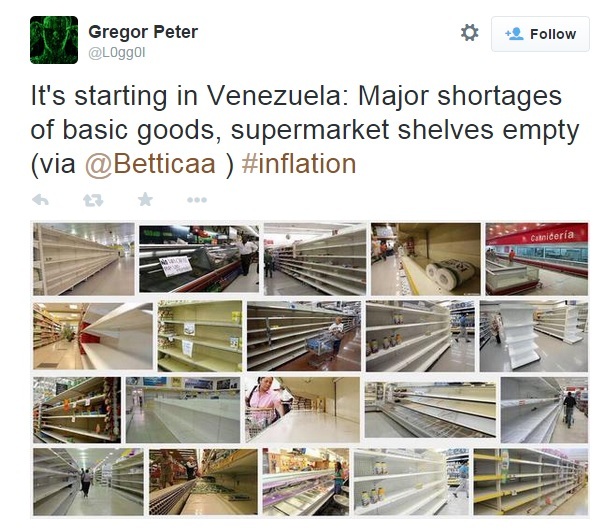 With store shelves in smaller communities across America emptying and not being refilled, to rising prices of the food that is still there, to the chaos being seen right now in Venezuela, these images and eyewitness accounts show us what the mainstream media isn't reporting. The images above represent a small portion of what is being seen all across the US in small towns and the images below is what we can expect in the very near future as the chaos in Venezuela is a huge window into what is coming to every town in America, starting with the small cities where it doesn't make national news, yet dozens of accounts have been documented extensively. For those that still think the images from Venezuela could never come to America's cities, below are first-hand, eye witness accounts, carefully and meticulously documented over in SQ alerts, proving that it is already here and just hasn't garnered national attention.....yet! Hey steve i started working at grocery store in early november. Ill keep you up to date as things progress. Btw Im in central kentucky. 1) i am hearing lots of complaints from customers about popular items no longer being available... like pork and beans and egg nog. Vendors were irritated because their normal popular, holiday items that they stock the shelves with every christmas season were not delivered this year. 2) i do seafood ordering and my orders are not being competely filled. The distribution center is frequently shipping fish that expires in 3 to 4 days when we used to get 7 days or so lead time. They are sometimes sending 'bottom of the barrell' product too, i presume to just fill the order. December 23, 2014 - Stores in Central Illinois Where I Live is Also Looking Bare. Stores in Central Illinois Where I Live is Also Looking Bare. I have been keeping an eye on the stores since I read the first alert concerning bare shelves. I do not shop at Walmart but I decided to go and check it out and sure enough it is true for this area as well. There are countless shelves where there are holes in them and since then I've been checking every other day and it is getting worse. I have to say I have never seen this before at this time of the year ever either maybe once in a while when there is a big snow srorm. I also checked Meijers here as well and it is looking the same way. Schnucks is getting that way but not as bad because it is our most priceist store. I could not find any self rising flour of any name brand, just the store brand and this is very surprising. It really does appear something is going down. Thanks Steve for your Alerts and all the information you provide and may GOD bless you. I live a block from the biggest grocery store in Fargo, ND and stop in 3 or 4 times a week because it's handy. It has been my regular grocery store for over 10 years so I know it well. This morning when I stopped in to get a few things I noticed the shelves were sparse and some items were just NOT there. The meat counter was also unusually sparse and the freezer sections were looking empty...I have never seen the store look like this in ten years at any time night or day, even when they were restocking, etc.! I asked the checkout girl if the shelves were bare because the store being a 24 hour grocery was planning on closing Christmas Eve and Christmas day?? (letting stock run down, perhaps?) She replied, "No, the warehouse has had trouble being able to get stuff-get stuff in...and we don't know why..."
**Sidenote, I was surprised once I actually looked, to find out although we have kind of a small town, a new mosque for the "Islamic Society" has quietly had been built (a pole barn type of building) this last year, right in a central location, complete with a school, big enough for 6,000 people less than a mile from me-what!!? But, happily, kids here can still sing about the Lord in the public schools. I attended a Christmas concert (public schools) where they sang christian hymns and ended with the Hallelujah Chorus. A bit of good news in these end times. Thank you for all you do. Be safe & Blessings! Those are just from the first two from the SQ alerts, click here to read more, understand what is happening and being seen and documented throughout the US. Add to what is already happening, look at the record colds being recorded across America and ask yourself how many people will be running out of food, water, heat and electricity? The MedCon Plan and Planners were a Disgrace, the Process was Broken... what if anything has changed?